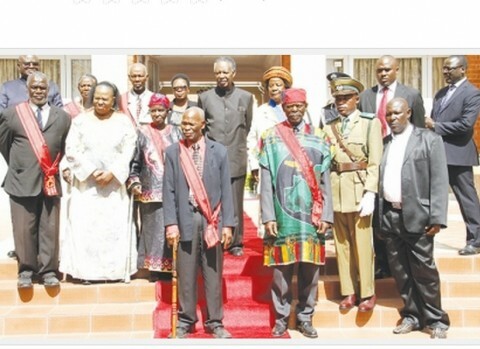 PRESIDENT Sata (centre back row) and acting Chief Justice Lombe Chibesakunda (second from left second row) pose honorees after the investiture ceremony at State House yesterday. – Picture by MACKSON WASAMUNU. IN a momentous investiture ceremony marking African Freedom Day at State House, President Sata yesterday honoured 11 people who included a police officer Justine Muwana who acted bravely in the recovery of two vehicles in Chililabombwe on the Copperbelt. Mr Muwana was awarded the President’s Medal for Gallantry which is awarded to citizens who may or may not be members of the defence force for acts of bravery. The medal is silver in colour and circular in shape and bears, on the observe, the President’s head and on the reverse the words ‘For Gallantry”. The medal is worn on the left breast suspended from a riband green in colour and a copper eagle in miniature affixed to the centre of the riband. As a recipient, Mr Muwana is entitled to add the letters P.G.M after his name. Also awarded were former Commissioner of Corrections Gibbie Nawa and historian and former Cabinet minister Mutumba Bull, who received the Order of Distinguished service First Division. This award, which is in four divisions, is given to Zambians and foreigners who have performed long or distinguished service to the country. Mr Nawa, who was awarded posthumously, died in March 2010. As Commissioner of Corrections, he was hugely influential in advancing the professionalism of corrections not only in Zambia but also in Africa, through his work and his pivotal role in the formation of the African Correctional Services Association (ACSA). Ironically, it was while at an ACSA conference in South Africa that he fell ill and was rushed back to Zambia where he died. Following his death, the International Corrections and Prisons Associations (ICPA) issued a statement saying his death marked the passing of a truly inspirational correctional leader who will be long remembered not only for his professional achievements but also for his personal kindness, humour and his truly infectious smile. “Gibbie Nawa’s contribution and influence has also been felt more widely on the international stage where he was widely known and admired for his sincerity, his compassion, his humanity and his thoughtful approach to improving the way we as correctional professionals go about our business,” the statement read. On the other hand, Dr Bull was the first Zambian to obtain a Doctor of Philosophy from the University of London and has for many years lectured at the University of Zambia (UNZA). A former member of Parliament for Nalolo in the Western Province, she was the first female Cabinet minister when first President Kenneth Kaunda appointed her Minister of Health in the 1970s. After leaving active politics in 1991, she rejoined UNZA as a Senior Research Fellow. She then served as Director of the Institute of Economic and Social Research, UNZA, for three years from 2005 to 2008 before continuing at the institution as a Senior Research Fellow and Coordinator of the Governance Research Programme. The President also honoured Cyprian Mulonda, Roy Chileshe, Paul Chisanga Jere, Frank Mulenga, Tyson Chamina (Chief Nkambo), Monica Chintu and Doris Chimanyika with The Companion Order of Freedom – First Division. Justine is not a cop but a prison officer also. Get your facts right.